With the demise of our front shrubs at the hands of last winter's Snowpocalypse, we've filled the front gardens with edibles of all kinds. 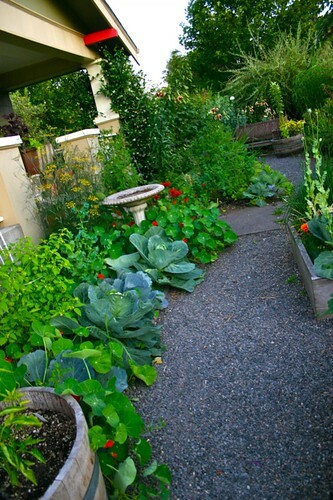 You've seen them here in the photos of the edible front border. 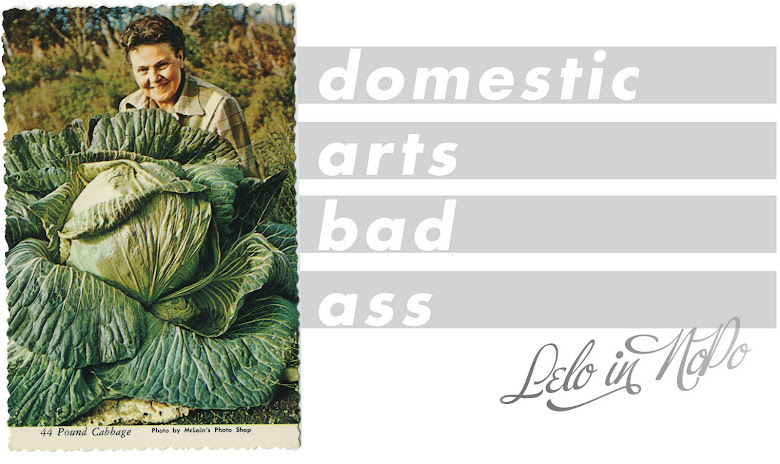 I've come to love cabbage, and that's good, because that entire front edge is cabbage. My favorite way to eat it? Simple, fresh, lightly dressed and served as a big delicious salad. And oh the beauty. It's a sturdier salad and holds up in the fridge for a few days, even growing better in flavor on day 2 and 3. I like to make a big bowl of this and munch on it in the afternoons when I need something crunchy, and a big pile on a dinner plate is a great side. As for a take-along to picnics or parties? It's the best for summertime: no mayo or dairy makes it an easy and safe bet. And the best part? Using as much as you can from your garden. I freeform this salad, meaning I make itup as I go along, with what I have, what's in season, and white kinds of flavors I'm looking for. This salad is all about your knife skills or how you rock that food processor. For the cabbage, I use a serrated knife and slice nice thin pieces, then cut them to bite size. My goal is to make all of the vegetables about the same size so they're easy to pick up with your fork. I like to run the carrots through the slicing blade on the food processor, but this would also be a great salad to rock with a mandolin. You can add thin slices of red bell peppers if you like, and add ground coriander and cumin to the olive oil and vinegar dressing. For the dressing, emulsify (shake in a jar) 1 part vinegar (red wine or apple cider are both great, try rice vinegar if you're going more for asian flavors) to 3 parts olive oil. Squeeze with a fresh lime for a great bright taste. Toasted sesame seeds are a nice addition if you want to add some jazz hands to your salad. Or should I say spirit fingers? Either way, I'm a convert to this simplified cabbage slaw. You can erase the horrible memories of coleslaw with mayo from your minds forever now. 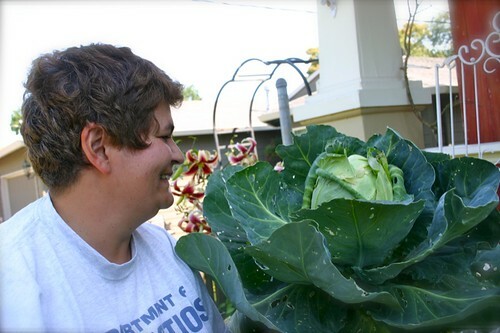 my chickens would just love to get their beaks around those big old tough outer cabbage leaves. So jealous of your cabbage savvy! I've tried cabbage 2 times and both times they looks like they were about to have a growth spurt and just pooted out. Maybe again sometime soon. Exactly, precisely, the food I'd choose from the deli counter -- or at your house for a potluck! I may even toss in a little radish. Delicious! I actually have some cabbages ready for harvest. Not quite as lusciously huge as yours but then mine didn't have the zoo doo advantage. And that last photo of Adri casting a sidelong glance at the cabbage is great. That border is beautiful. Nice job joining function and beauty. Oh yes! 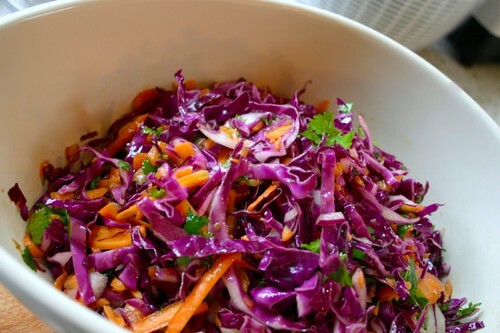 Cabbage salad sounds perfect for a picnic basket! That cilantro option sounds divine. P.S. Congrats on a successful pie-off. So much fun! thanks. love love love the blog !!! 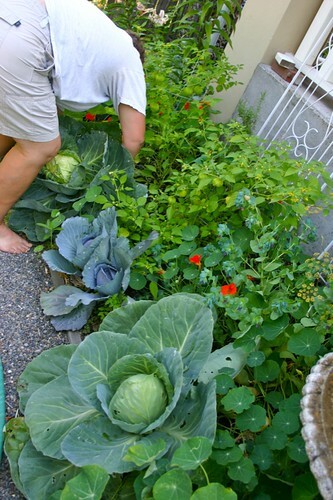 The cabbage border looks so good that I actually just finished incorporating one into next years garden plans!